'Shoot Them': Journalists Captured In Libya 'Thought It Was Over' : The Two-Way The four New York Times staffers who spent six days in the hands of fighters loyal to Libyan leader Moammar Gadhafi tell their story today. 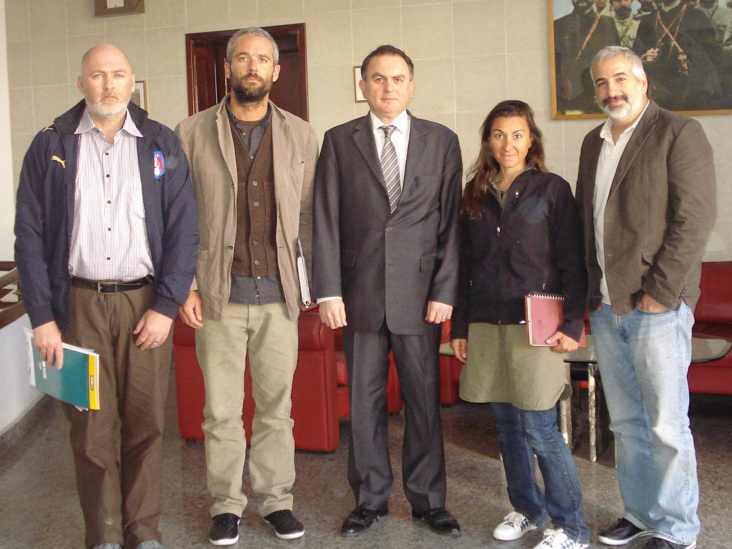 (Left to right) New York Times journalists Stephen Farrell and Tyler Hicks, Turkish ambassador Levent Sahinkaya, and Times journalists Lynsey Addario and Anthony Shadid, at the Turkish Embassy in Tripoli, Libya, on Monday. Turkish diplomats helped secure the journalists' release. The four New York Times staffers who spent six days in the hands of fighters loyal to Libyan leader Moammar Gadhafi tell their story today. -- They were captured when their driver (who is still missing) inadvertently drove into a checkpoint. As they were pulled from the vehicle, opposition fighters started shooting at the Gadhafi soldiers. "You could see the bullets hitting the dirt," Times Beirut bureau chief Anthony Shadid says. -- The journalists and soldiers ran into a building. That's when, Shadid says, he heard the soldiers say " 'Shoot them.' ... And we all thought it was over." Another soldier intervened, saying that because the journalists are Americans they could not be shot. -- Photographer Lynsey Addario was punched, groped and threatened throughout. "Every man who came in contact with us basically felt every inch of my body short of what was under my clothes," she says. Along with Shadid and Addario, Times staffers Stephen Farrell and Tyler Hicks were held. Turkish diplomats helped secure their release. For NPR's coverage of the conflict in Libya, click here.